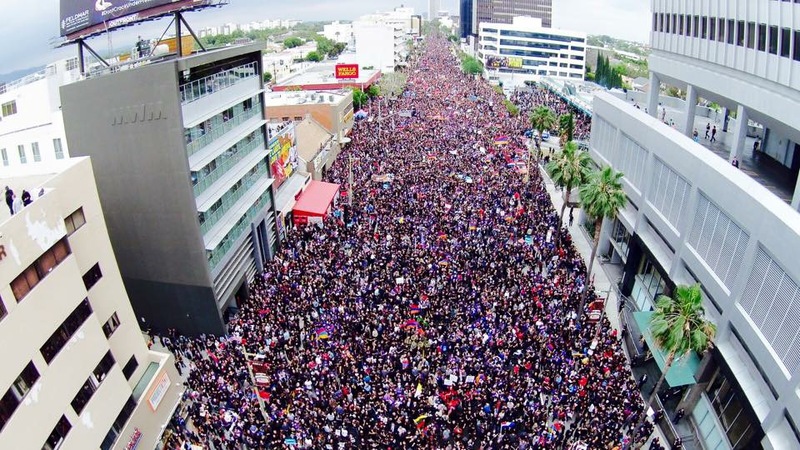 LOS ANGELES — An estimated 130,000 people took to the streets of Los Angeles on Friday, April 24, calling for justice for the Armenian Genocide, as the community turned out in droves to mark the Centennial of the Armenian Genocide. The March garnered worldwide media attention as news outlets from around the world arrived to report on the historic event. The Armenian Genocide was the number one trending topic on social media outlets in Los Angeles for the day, while it took second place around the world, only trailing Apple, Inc.
Demonstrators in the March held up signs saying where their grandparents or great-grandparents came from in a symbolic gesture showing that they were all there on Friday because someone survived the Armenian Genocide. The demonstrators, clad in purple and black, also held up flags and signs thanking all those countries around the world who have recognized the Armenian Genocide. Another Los Angeles City Councilman, Paul Koretz, said that, as a Jewish person, he felt an especially strong connection to the Armenian people’s struggle for justice for the genocide of their people. “As a Jew, I know of many loved ones who were lost to the Holocaust, which may have happened because the Armenian Genocide was ignored,” he said. Armenian Youth Federation central executive member Gev Iskajyan gave an impassioned speech, asserting that Armenians will never give up on their fight for justice and their claims to their rights and property. Armenian Revolutionary Federation – Western US Central Committee Chairman Dr. Viken Hovsepian addressed the crowd in Armenian. He thanked everyone in the Armenian community for doing their part and participating in the march. He similarly condemned Turkey’s century of denial, but asserted that the world will know the truth, citing a string of recent decisions by global powers recognizing the Armenian Genocide, including Germany, Austria, and the Pope. Also speaking at the rally were co-chairs of the AGCC, AGBU chairwoman Talin Yacoubian and former chairman of the Armenian Bar Association Garo Ghazarian. Local performer Payla Kevorkian debuted a new song by composer Guy Manoukian, arranged specifically for the centennial, with lyrics written by Hovsepian. At the conclusion of her performance, a hundred white doves were release into the air.